Top 20 Well-Read Cities in the U.S.
Well, by compiling sales data of all book, magazine and newspaper sales across all formats – in digital and print – since Jan. 1, 2011. Amazon.com included cities with more than 100,000 residents and it was calculated on a per capita basis. So who came out on top? Cambridge, Massachusetts, of course. As home to the prestigious Harvard University and Massachusetts Institute of Technology (MIT), Cambridge also topped the list for reading the most non-fiction books. Boulder, Colo., lives up to its reputation as a healthy city by topping the list of cities that order the most books in the Cooking, Food & Wine category. Whilst Alexandria, Va., residents topped the list of the city that orders the most children’s books. Florida, the sunshine state, was the state with the most cities in the Top 20, with Miami, Gainesville and Orlando making the list. Big question — and it’s probably a big answer. But several days ago, Swiss educator, Vicky Loras started a conversation with Finnish School Principal Esa Kukkasniemi. You can read the entire interview here in her blog as well as opportunities for you to talk with educators in Finland. But here are some statements from Esa that I highlighted in Diigo, as he ticked off major important points that have led to success in Finland’s education system. ..much of it lays in the Finnish educational culture: teachers are respected professionals..
One really important issue is that we have quite small economical differences in the income of the people if you compare us to most of the countries in the world. We have strong scientific evidence that where the economical differences between people grow too big, the learning goes down. We don’t test the teachers at all..
We have strong belief in the professionals. ..social media gives possibilities of creating your own PLN (personal learning network). For me (Esa), Twitter has been a great tool for that for the last few years. (Esa) and other great educators (among them the enthusiastic teachers Timo Ilomäki andRochey who started the chat) have started their own chat on Twitter, where teachers from all over the world can post questions on Finnish education every Thursday. You can follow their discussions and find other Finnish educators as well under the hashtag #finnedchat. Incidentally, I just did a scan of #finnedchat tagged tweets and learned that..
Teachers are biggest single profession in Finlands new parliament. 16 educators. Author David WarlickPosted on May 21, 2011 May 21, 2011 Categories education, learning, teachingTags education, finnish education, learning, teachers, teaching, warlick24 Comments on So What is It about Finland’s Schools? Earlier this week, I wrote about a guest-authored Mashable blog post, 6 Reasons Tablets Are Ready for the Classroom. The author, a representative of McGraw-Hill, seemed to be saying (and these are my words) that perhaps the textbook industry is ready to go tablet (digital) — the fact of which I am not so sure. In my post, I critiqued the six reasons and I also engaged a bit in comments discussion at Mashable — and I took a bit of heat for suggesting that the textbook industry may actually be a useful part of the formula for textbook 2.0. But let me accentuate the “may” part of that statement. Yesterday, Mashable author, Sarah Kessler, wrote “The Case for Making Online Textbooks Open Source,” where she drew attention to programs at MIT and Carnegie Mellon that post lectures and other course materials online for free. She also shared an infographic (not linked) that compares the cost of traditional textbooks to open source course materials. (More about the Infographic, and its authors below — and don’t miss that part). ..textbook authors must agree to have them distributed online without charging royalties — something that may work well in the software world, where engineers often work on projects while keeping a day job, but typically avoided by writers who put their sweat equity into one book at a time. The question this raises in my mind is, “How many authors actually make a living as authors, doing it as a full-time job?” I suspect that the number is quite low, compared to the totality of books continuing to be published today. Most, like myself, write in order to subsidize our incomes and/or enhance our day jobs. It’s something that we do on the side, like a number of my college professors who wrote their own textbooks and had them stocked in the college bookstore for us to buy. ..books for K-12 classrooms must meet state standards, and most states don’t have procedures in place for approving open source textbooks. OK, Why? Why do states have to approve textbooks? I know that part of it is to assure quality with regard to the state’ educational objectives. But I thought that at least in part, it was about the ability to buy in bulk and negotiate discounts? Am I wrong? If i am not wrong, and the word “free” is inserted into the formula, does the need for bulk purchasing go away. And if quality is the issue, why do you need to create a system for evaluating instructional materials at the state level, when a system is already in place — teachers. Why can’t we trust teachers to select the instructional materials they need for their learners in their classrooms? Here are six reasons why we don’t need textbooks. …and I’m not just talking about iPads. Many teachers tell me that they have completely dropped their textbooks, replacing them with their ever evolving and growing Moodle or Blackboard sites. This makes a lot of sense to me — textbook as platform to be populated by the very teachers who will use them. Does such a platform already exist? Please comment. What textbooks do is to take knowledge, that’s written someplace else, and present it in a way that satisfies the needs of the consumer. Can’t teachers respectfully and with regard for the law select, shape, mash and mix existing digital content into modules or learning objects for their learners. Might we even see commercial modules, produced by what use to be the textbook industry, that can be selected and purchased, for a nominal fee, from an app store style of content market place. only two has less than a bachelor’s degree. 52 of them have at least a master’s degree. That is an enormous reservoir of knowledge and experience. No one needs to do it alone. It’s not open source because it’s free. It’s open source because it’s free to be improved — by a community. Many programmers have contributed to the development of Firefox, and many more have developed extensions that add new functionality. Following the same model, communities of teachers can contributed well researched and carefully designed modules for portions of their curriculum (or standards if you insist) that they know well and about which they are especially passionate. Then they can collect models from other teachers and assemble them into the platform, constantly re-evaluating the materials, editing them, adding new ones in, deleting old and less effective ones out. How many of us assemble our own library of digital resources (bookmarks) and make the curation of that library a part of our working process? How many of us do it well? Might content curation become a 21st century skill that learners should be developing as part of their formal education? Should students be guided in growing their own digital textbooks into personal digital libraries? — reading, writing, and arithmetic. But I’m thinking of an expanded version that reflects an increasingly networked, digital, and info-abundant world. 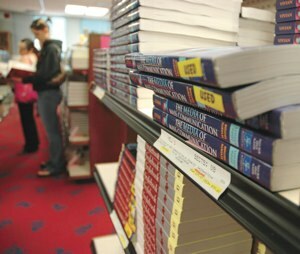 Do textbooks, from the bookstore reflect today’s prevailing information environment? No! But do digital textbooks, that are stamped “Approved” by some government agency, reflect an increasingly dynamic information environment and rapidly changing world any better? I think not! Teachers should be collecting, evaluating, editing and assembling their own textbooks, because it requires them to practice and talk about the contemporary literacy skills of a digital and networked information landscape — in front of their learners. And finally, that last one, number six, brings us back to the Infographic. Here’s the url (http://goo.gl/2ICIE) to the graphic. I’m not linking to it and you shouldn’t either. The graphic compares the cost of various configurations of textbooks and the savings of going open source. But as I examined the graphic, I began to get that irritating twitch that happens when what I’m reading seems to be trying to convince me of something rather than inform me. The numbers were rather precise, but there were no sources given. At the bottom was the statement, “All data based on current averages” and a list of web sites, none of which seem to include the data displayed on the graphic. Doing some URL disconstruction, I got out to the hosting web site, Onlineschools.org (ols), and that domain, onlineschools.org, seemed familiar. Doing more digging, I found a comment, in the original Mashable blog post by Canadian teacher David Wees linking to this blog post by California educator Dan Meyer’s. 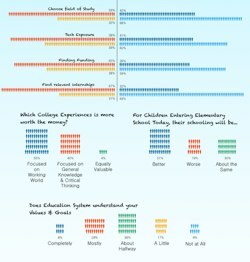 In the blog post, Meyers uncovers how ols uses infographics like this and lists of the “100 top teacher blogs” or “100 top Administrator Blogs” to get bloggers like me to link to them, getting ols to the top of Google searches performed by people who are looking to get degrees without classrooms. This way, ols gets to becomes a link in the cash cow that online education appears to have become, and sometimes with the help of fraudulent practices. So don’t link to ols, and do link to Dan Meyers. If you have other resources or ideas regarding the evolution of the textbook, please comment. Want to watch a movie? Netflix is a better librarian, with a better library, than any library in the country. The Netflix librarian knows about every movie, knows what you’ve seen and what you’re likely to want to see. If the goal is to connect viewers with movies, Netflix wins. Post-Gutenberg, books are finally abundant, hardly scarce, hardly expensive, hardly worth warehousing. Post-Gutenberg, the scarce resource is knowledge and insight, not access to data. Only 6 Reasons Why Tablets Are Ready for the Classroom? I caught this guest-posted blog entry in Mashable last night, as I was taking one last look at my Flipboard on my way to bed. ..and I typed a reply to a comment that was rather more terse than it should have been and that typically is my nature. But the issues are so important to me, that I thought I would post a longer response here. My initial response to this “reason” is, “Well yeah!” From a textbook publisher’s point of view, computers are far superior in their delivery of content when you factor in audio, video, and the ability to digitally highlight, annotate, and directly access a dictionary. This all looks great on the exhibit hall and works well in the classroom. But the mere delivery of content is an extraordinarily and dangerously limiting lens through which to seek the ideal learning device. ..everyone knows that people will do inappropriate and not school related things on the tablet. From the author’s argument, the reason should have read, “Tablets are ready for the classroom,” and I couldn’t agree more. But a classroom filled with curious minds and practically unrestricted access to a web of content and connections to each other is an entirely different place from what most instructors are accustomed — and restricting access to content and conversation are the antithesis of modern learning. So I would say that many, if not most, classrooms are not ready — and this is something that we need to fix very quickly. The argument here seems to be that students are lazy, weak, don’t like to pay attention, and shouldn’t rely on classmates to support their learning. But that said, I agree with the reason. Our learners in, while outside the classroom, are accustomed to rich, responsive, provocative, rewarding, and forgiving information experiences that practically define pedagogy. Learners should be engaged in similar experiences in their more formal learning environments. The more bristly part of me wants to dissect the meaning of <em>competitive</em>. But instead, I will admit that I am not nearly knowledgeable enough about the vast array of apps available for iOS and Android devices. My sense is that we still have a long way to go, and simply acknowledging that an iPad will work with Blackboard misses the far more interesting question. 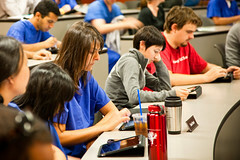 Can Blackboard adapt to and leverage the potentials of a mobile learning landscape? It is true that tablet computers operate well within the cloud computing environment that seems to be emerging on many college campuses and increasing in the K-12 arena. But the question remains, are those cloud environment empowering learning and merely facilitating teaching? This may seem like a senseless question, but it isn’t. This is probably true, if the iPad is the fastest selling gadget of all times. I must admit some surprise at the number of iPads I see at conferences, especially events for school and district administrators, and the device is barely a year old. But this is a non-issue to me. It isn’t education’s job to wait for availability. If mobile information and communication technologies are the most appropriate platform for preparing the next generation for their future, then it is education’s job, and the job of the society that employs it, to assure that those ICT’s are there — regardless of budget constraints. I was too harsh in my comment last night. I seemed to completely dismiss the textbook industry, and that was unfair and unfortunate. I believe that we need their expertise and even their incentive to help reshape teaching and learning. But our efforts must not be limited to trying to make textbooks digital. Instead, we need to learn how a digital learning environment redefines and completely reshapes the textbook in a way that reflects how today’s environment is redefining what it means to be educated. Education, as we most often see it, is designed to teach students how to be taught. Today, being educated means having a broad and effective sense of the world, how it works, and its heritage. But perhaps even more importantly, being educated requires the learning literacy skills involved in living a learning lifestyle — having been taught how to teach yourself. Textbooks need to be platforms for generating curiosity, passion, and habitual learning. Author David WarlickPosted on May 17, 2011 May 18, 2011 Categories education, learning, literacy, teaching, technology, textbooksTags education, iPad, learning, mashable, teaching, textbooks, warlick12 Comments on Only 6 Reasons Why Tablets Are Ready for the Classroom? — and it was an impressive expo. The picture above shows only one of three rooms filled with representatives of showcased schools from across the state, examples of what they’re doing with technology in their classrooms, some students to give the learner perspective, and lots of local educators who’d come to be wow’ed. Becky makes a big deal about how I travel the world, this big technology guru, but what impressed me was things that I saw here that I didn’t know about — how classroom teachers and their tech facilitators are playing with emerging technologies — and I use the term play with the most respectful and admiring intent. I’ve written about QR-codes, those two demential bar codes that can be used to access web pages and other information resources with a smart phone. I’ve used them for more than a year in my presentation slides, on my business card, and even in my latest book, A Gardener’s Approach to Learning. But for the first time inside the U.S. I walked into an education event, and they were everywhere. Every business card handed to me had a QR Code. One of the schools is using them to direct elementary students to the proper video tutorials on their iPod Touches. There were teachers there from the school system I served as tech director 20 years ago. They’re experimenting with Nooks, the eBook reader that runs Android — some interesting potentials there. I honestly believe that these educators are seeking new ways to use new information and communication (literacy) technologies in teaching and learning for the very best reasons. But we need better answers than, “Because it’s technology. Our children will do anything if it’s with technology.” ..and “this is the engagement!” pointing at the an iPod Touch. When we talk about modernizing formation education, this is what we should talk about, not the technology. @dwarlick Please elaborate about Pender County and Minecraft. I’d love to hear your opinion on this. ..which resulted from a tweet that I posted from the MEGA meeting at the Friday Institute yesterday. Pender County is one of the quieter, flatter, more humid and scarcely populated counties in North Carolina. It consists of seven towns, none of which have you heard of, including two beach communities on the Onslow Bay. But they’ve got some interesting things going on in their schools. I’ve written about Lucas Gillispie before. 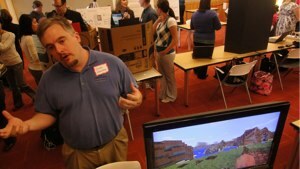 He’s a young educator and a gamer — and one of a handful of teachers who have been, for the past couple of years, asking, “Might I use this video game experience to reach some of the harder-to-reach students in my school?” Teaming up with New Yorker, Peggy Sheehy, and now others, Gillispie is exploring the potentials of using multiplayer role-playing video games to help learners develop problem solving, collaboration and reflection skills, and to become story tellers. So, at yesterday’s MEGA meeting, he had a booth set up demonstrating Minecraft, and talking about fifth graders who are using this tamer (my supposition) video game to develop some of the same skills. For those who are not in the know, and I learned this from my son, Minecraft is currently being developed by Markus (Notch) Persson, a Swedish game developer who left gainful employment to work independently. With proceeds from the hundreds of thousands of paying Minecraft players, he has formed the company, Mojang. The game is a 3D sandbox-style game where you mine for materials or resources and use them to build stuff. More recent versions of the game involve health points and other game dynamics, but it remains, essentially, a sandbox. I asked Lucas where this gaming activity belongs in an elementary school, and after giving some really good answers from a rethinking how we do schools perspective, he finally said, language arts. 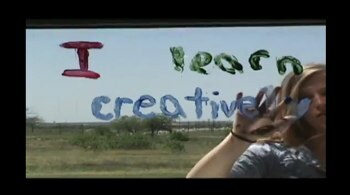 They have only started this with 5th graders, but their plan is to have students play, build, experience the adventures and then write to audiences about those experiences. Also, this is my first test of Blogsy, a blog editing app for the iPad. I like it! I know now that it was a quote from Muriel Rukeyser, a 20th century American poet and political activist and that it had some bearing on the quest, or a pilgrimage, that we had set ourselves to. 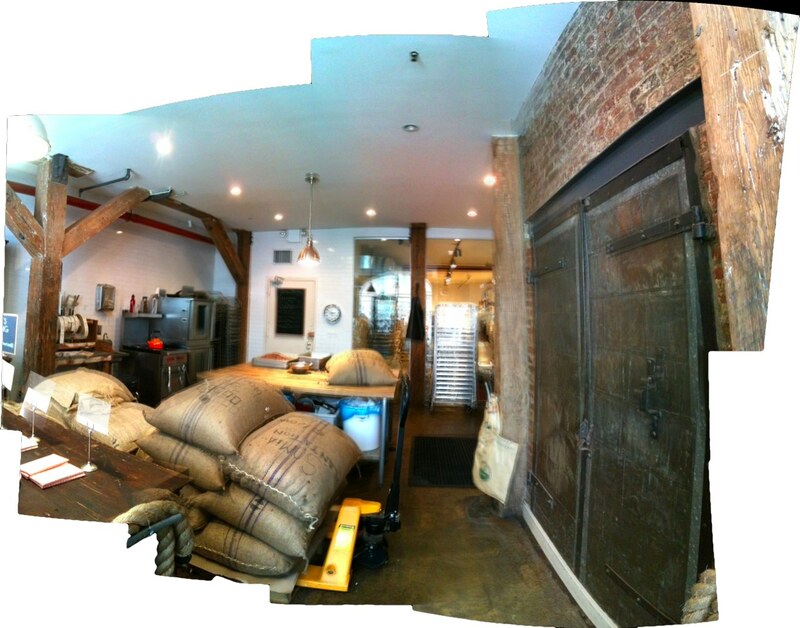 Those who know me well, know why I might use the “P” word to describe our search for Mast Brothers’ Chocolate. Our quest was based on a story I first learned about from a video posted by Cool Hunting in May 2010. It’s two brothers with a passion for chocolate and its making — in the old way. We found the place, with the help of my brother, along the “L” line, rolling into a trendy and gritty neighborhood near Brooklyn’s Williamsburg. There didn’t seem to be sign on the store, but when we finally asked two hipsters sitting on barrels with some sort of grainy meal steaming on paper plates, they said that we were there. We’d visited their web site before leaving for New York and had tried to register for a formal tour of the small factory, only to learn that they were booked into June. So we only got to see the front room (see above). But an energetic!young fellow behind the counter answered our questions about cocoa, nibs, and even organic cocoa mulch, which they sell for $2.00 a bag. No computers. No WiFi. Not a wire, LCD, or coder in sight. Just passion and story. If I took the time right now to think through and write down a prioritized list of the most important things our children need to be learning today, passion would be one of the top two. What made me decide to post this was the initial teacher blog post. It is followed (reading up) by reflective articles from students. Here’s the text of the initial post and a link to the video (YouTube) and the blog. As a teacher, I’ve always believed my job is to pose questions, not answer them. Fittingly, this whole project began because of a question. The class was reading Orson Scott Card’s “Ender’s Game” and the students were wrestling with a seemingly simple question: Could children, using the internet, have a dramatic impact on the world around them? Could they influence public opinion, and make a mark on their world? You name it, we probably did it. Here’s the best part, though: We had to get the entire thing done and released in four months, using no more than two hours a day, five days a week. What follows is the account of that adventure – the highs and lows, good moments and bad, through the eyes of the incredible students who made this project happen. If I am to be credited for this, let it only be as the organizer or the conductor of the symphony. The students were the talented musicians who crafted this masterpiece. I got a 35, I reckon! It shouldn’t end with a question mark. It should end with an exclamation point. I’ll give myself a 35 for the infographic (815KB) that I posted the other day (My First Stab at Infographics..) for your consideration. I get that many points for the effort, probably about ten hours of work. The effort was good. Each time I scrapped the whole thing and started again, it was because I learned something. It was because I realized that I was going down a wrong path — a path I will not take again. Each path, never to be taken again, is worth at least 5 points. Some of the 65 points that I didn’t get was explained to me by Steve Ruddy, who commented..
An infographic usually uses the info to convey a point, I cannot figure out what you want me to deduce by all of this information. Most importantly I don’t see what the top half has to do with the bottom half at all. Hope this feedback helps you make better infographs. He’s absolutely right. All that I did was to convey individual chunks of data as blocks of images and then stack those blocks in a way that made sense to me. There was a story there. There was a purpose to the sequence of blocks. But I didn’t tell tell story. There was no mortar to give the blocks substance and meaning. To Ruddy and others who viewed the graphic, it was just a stack of blocks with no exclamation point. Thursday’s IGAD usually points to a data source that teachers or learners might use to craft their own infographic or data visualization. Today, however, I add an extra post about “breaking news” infographics, which are explicitly designed to tell a story. The examples are graphics, telling the story of the raid on Abbottabad. As a result? Well, I’m scrapping my current infographic and starting over again. But it’s not so much to reshape the blocks, but to mix the mortar. Is it wrong to expect a 100? Does that emphasize the wrong thing? Shouldn’t we wait until the end of the course for something near 100? ..or the end of the term? ..or graduation? ..or a long time after that? Author David WarlickPosted on May 5, 2011 May 5, 2011 Categories Creative Arts, education, learning, teachingTags education, grades, infographics, learning, teaching, warlick6 Comments on I got a 35, I reckon!